The year was 1995. We were searching for quality, food-grade glass containers and closures at an affordable price and found none. So we decided to start our own container business. We quickly discovered that many others were in the same predicament. Home canners were having a harder time finding canning jars in the store, especially from August through May. Small start-up businesses wanting to put their best recipe in a jar found that home canning jars were too expensive, and home-canning jars leave no room for a label! Other jar distributors wouldn't return phone calls for less than pallet-size or truckload orders. Those who found us by word-of-mouth were thrilled to find a source of jars, and even more excited by the reasonable pricing. We figured all we needed to do was spread the word, so we decided to try a simple web site on the Internet. As expected, more food-packers started calling as a result of the web site, but we had not even contemplated the world of container candles! We have slowly added a variety of containers to our stock offering for both food and candle use as we listen to the needs of customers. More recently, candle-makers have indicated the desire to purchase all their supplies from a single affordable source, so we have been expanding our offerings to include premium soy container wax, full-strength made-for-soy fragrance oils, and high-quality natural wick assemblies. We're glad that you have found us! Let us know if there's something we can do to improve our selection and service. 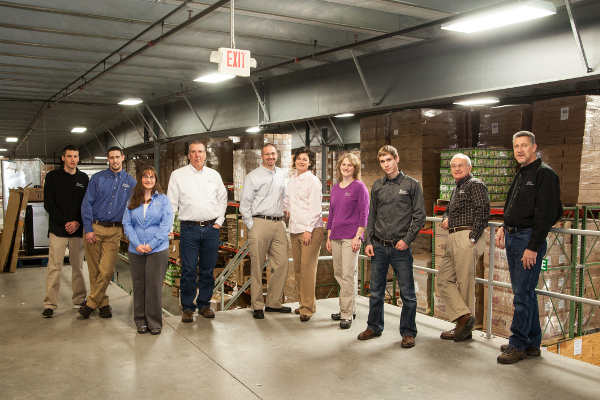 Your Fillmore Team (left to right): Ben, Chad, Kim, Kent, Keith, Lisa, Michele, Conrad, Larry and Rick. Our warehouse and showroom are open Monday through Friday, 8AM to 5PM. We appreciate 24 hours notice for pick-up orders. From Route 30, take 340 East (Old Philadelphia Pike). Turn left at the first traffic light onto Horseshoe Road. Turn left at the first traffic light onto Hartman Station Road. Take the first right onto Norman Road. Fillmore Container is in the last warehouse on the left.